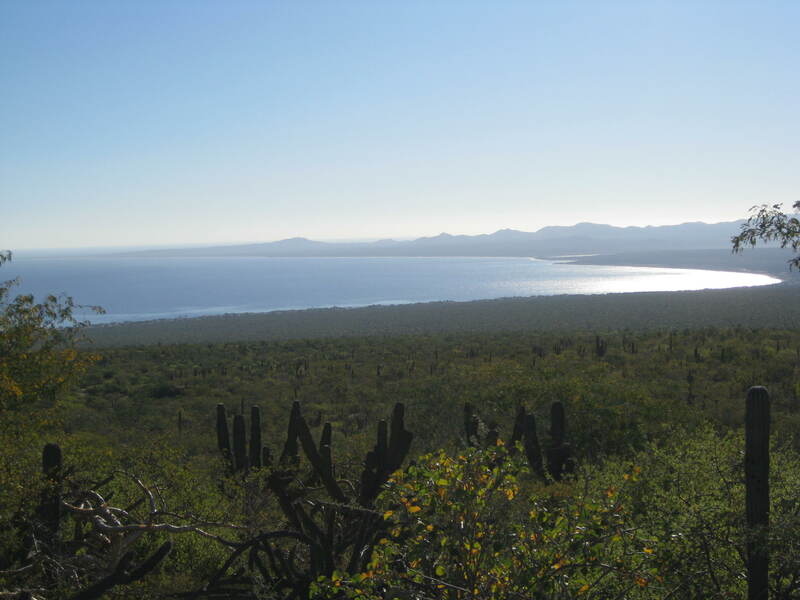 The Baja California Sur landscape is one of interesting contrasts. 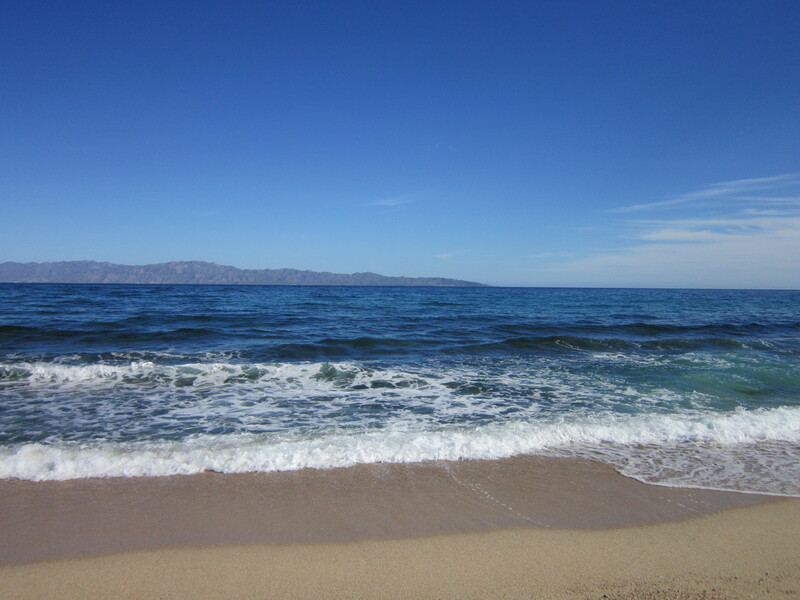 Here’s an example: Can you find the island in the above photo? 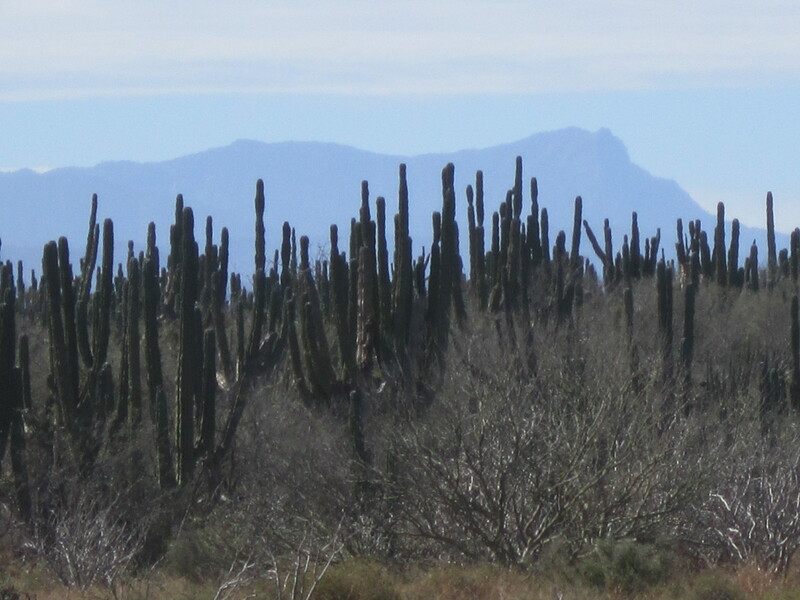 Although you can’t see the water beyond the cactus forest, the mountains in the photo form a rugged island in the Sea of Cortez. I shot the following photo in the opposite direction, towards the southwest, and these mountains represent the northern end of the Sierra la Laguna. Some have called that range an “island in the sky” because it rises so steeply from the surrounding desert. In another age, it literally did constitute an island surrounded by sea. In their highest elevations, these craggy mountains form a cloud forest during moist summers, and the 7000’+ peaks are covered in mist. On the slopes and high meadows of the Sierra grow oak and pine forests, and the range has been named a Biosphere Reserve. Looking at the mountains from the desert and over the tops of thousands of cardons, I cannot picture the wet oases which lie in the upper reaches. Peaks, desert, sea; pine trees, cardons, palms–contrasts emphasize the beauty of this surprising land in the same way that the unanticipated aspects of our lives, the glorious highs and sometimes difficult lows, emphasize the importance of an average day. What contrasts of landscape lie around you? What is the importance of an “average” day? What does that mean to you? This entry was posted in awareness, Baja, cactus, landscape, ordinary miracles. Bookmark the permalink. Thank you so much, Heather–for reading and for your generosity and your kind spirit. Beautiful essay. The 2 questions about average are thought provoking. The kind of questions that drive me batty, because first we have to define just what an average day is. Sometimes ” average” is used as mediocre. Is an average day what I do usually? Customarily? How was your day? Oh…….average. Does that mean so-so? Or does it mean about the same as any other day? Suppose we assign a number to each day. For example, 10 is when your children and sweetheart come and hug and kiss you and tell you how much you mean to them. A zero is the day one of them dies. If we number each day of a month, then we could arrive at an average. Do some people purposely arrange their lives so that they never have extreme contrasts? Oh my, that takes us down many other avenues. I shall think on your questions for days to come! Thank you, Ms. B. Thank you, Jeanie. I am so delighted you are reading and posting comments; you are such an astute reader and helpful reviewer. I really thought of using “ordinary” instead of “average” and actually think “ordinary” works better. But the phrase “an ordinary day” seems to be stuck in my mind from a poem I have read and loved (but cannot find right this minute), and I didn’t want to steal the line without acknowledgment. And then there is that phrase “ordinary time” which is related to the liturgical calendar of Catholicism. I’ve always thought: how could any time be considered “ordinary”? Isn’t all time, each minute, miraculous? But then again, it’s really a pretty ordinary word. No more possible spoilers! I’m just now watching season one of Downton Abbey. And I really love it–it’s not your “ordinary” TV show. It’s also really interesting to reflect on how my definition of a “10” day changes over time. There was a time in my life when a “10” was a Sunday I could get a nap. When I’m 97 years old, a 10 might be any day my bowels function. And when I’m 100 years old, a 10 would be any morning I wake up. So, relativism is one way to define contrast? Contrast is a word that is itself full of contrasting sounds. The harsh C sound as in cat. Immediately softened by an ahn sound. And delightful complexity in truh and stuh. Bookending the unmusical aa as in cat. Trast. 8 little letters. I am all a-wonder. I just got back from Carlsbad caverns. The desert above is sparse and actually burned from a fire several years ago. But underneath 700 feet below are large caverns filled with glittering formations and popcorn texturing. Who would imagine what secrets lay below when the cowboy noticed the “smoke” of millions of bats leaving every night from this small opening? What a perfect example of not knowing what secrets lie around us! I so appreciate your comments, Linda, as well as your friendship and wisdom. Thank you. just a quick note to tell you thanks for continuing Practicing Wonder! just love it! I am now making a point to at once (usually more) a day to stop and admire that shows me the Wonder of God,s creations. a sunrise, a sunset, amazing clouds formations, last nite’s incredible rain and lightening display… our hibiscus and Meyer lemon tree got moved from the barn to the front porch this morning! getting ready to put up hummer feeders! all of this gives me pause…we miss you and Ron and are looking forward to seeing you all after your trek back! !